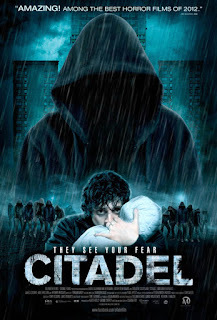 Haunted young man Aneurin Barnard failed to save his heavily pregnant wife from a feral, seemingly inhuman gang of hooded figures, an experience that turns him into a paranoid agoraphobic. He lives in constant fear of the “hoodies”, and eccentric priest James Cosmo feeds his fear by demonising them, insisting “they take children…”. Debuting writer-director Foy (who got the gig for SINISTER 2 based on this) cleverly takes the tabloid-fuelled, post-EDEN LAKE “hoodie horror” concept to a monstrous, yet relatively low key, new level here via the race of fleetingly glimpsed, grotesque in-bred antagonists, spawned (with shades of THE HILLS HAVE EYES) from abandoned siblings in the 70’s. There are scenes of genuine menace and potent – albeit discreet – violence, including a traumatic attack sequence on a bus. Tomandandy’s pervasive score enhances the unrelentingly doom-laden ambience, as does the authentically wintry backdrop, and Barnard’s central performance is impressively unhinged. A little pedestrian at times, it pays novel homage to everything from CAT PEOPLE to THE BROOD and finds unsettling images of caged, deformed infants in the dark spirit of benchmark American horror films like THE TEXAS CHAINSAW MASSACRE.